My view on stories has evolved over the *censored* years I’ve been working as a script editor. I started out working mostly from intuition and have over the years added experience and various screenwriting theories to my arsenal. One thing that sticks out from those years of experience (okay, okay, it’s 18 years as of about 2 weeks ago), is what the most crucial bit of a script (or other story) is. Character. It seems like a total ‘duh’ thing to say, but there are plenty of scripty folks (writers, developers, directors and producers) with a somewhat different view. Some seem to think it’s all about big explosions, others about structure and plot, and some think dialogue is most important. And sometimes they’re right. Most often, even if they are right (or rather, successful), it means the story itself is, shall we say, less than engaging. And that last word is kinda key, there. Engaging. The story needs to engage the audience. Writers need to make the story engage with the audience. When we go to the theatre (cinema or live), we go to be entertained. Most of us, most of the time, anyway, so I guess I’m sort of limiting this to popular, commercial, bums on seats entertainment. And cool and entertaining though they are, the best way to engage the audience is not with explosions. They lose their punch after a while. You can probably guess what I’m going to suggest is the best way to engage. Well done, you. Round of applause. So how do you go about making sure the characters in your story engage with your audience? The answer is simple: by writing them as if they were real human beings. Easier said than done, but then I said the answer was simple; the execution of that answer is a different matter entirely. By writing characters as if they are real human beings, we get an audience to care about them (and remember, loathing is a sort of caring). And by caring those characters, we engage and empathise with them. A lot of the human experience is bound by empathy, by being able to put ourselves in someone else’s position and at least getting a sense of what they must be feeling. Granted, not everyone is empathetic as they perhaps should be, but that is a different discussion for a different time – probably with a therapist. Now, there’s oodles to be said about writing characters in such a way that the audience will empathise with them, so I’ll be saving some of those oodles for blogs further down the line. Here I’ll limit to what the picture is about: characters defining themselves by what they do. It’s that old saying: actions speak louder than words (especially if those actions lead to explosions). And yes, speaking words is an action. But is a character saying “I’m sad” really the best way of making the audience care about them? How often do the people around us, or we ourselves, literally say “I’m sad”? The answer is highly likely to be: not often. And that’s all to do with a defence mechanism. We throw up walls around us, hiding away the truth about ourselves from the world and people around us. And often from ourselves as well. Now, that sadness may be true for that character, but it’s often not truthful for them to be so blatantly honest about it. The defence barriers need to be brought down for such blatancy to work and feel truthful (naïveté, alcohol and extreme emotion can bring down those barriers). And before that happens, characters will hide their sadness in such a way that it usually seeps through anyway for the good observer. And so they’ll maybe sigh before speaking (though that is one heck of a cliché) or be unresponsive and not say very much at all. They may deflect by acting excessive cheery, cracking wise, oozing sarcasm or being quick to anger. Plenty of ways and plenty of other emotions besides sadness that it works with. 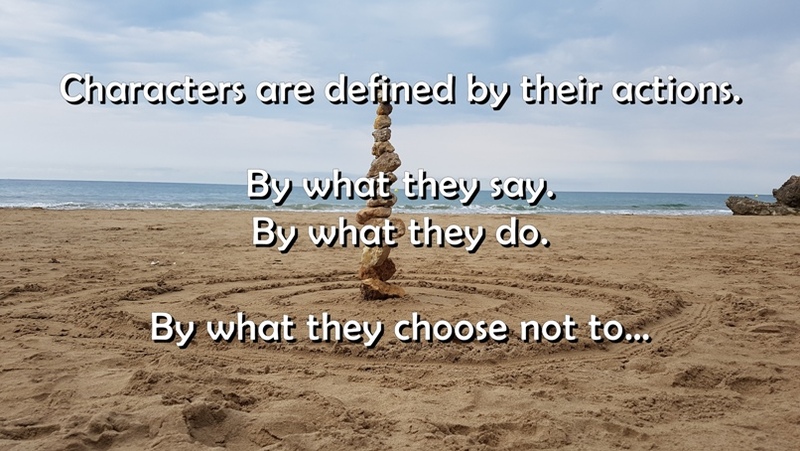 So delve into your characters, find what makes them tick, what their actions mean about their emotional state, what their emotional state means to their actions and don’t be afraid to challenge them – and yourself.